Any opera (novel, movie, play) with the word magic in the title sets you up to expect just that in the story or staging. Those expectations are certainly met in the production of The Magic Flute, Mozart's final opera, currently at the War Memorial Opera House. San Francisco Opera's colorful 2010 coproduction (with Washington National Opera, Opera Carolina, Opera Omaha and Lyric Opera of Kansas City) could hardly be more visually enticing: Production designer Jun Kaneko, an artist who also worked on innovative productions of Madama Butterfly and Fidelio, has created sets and costumes that make one think of Julie Taymor, who shot to fame with the dazzling and imaginative costumes, masks and animal puppetry of The Lion King. Make that three or four Julie Taymors, each trying to one-up the others. The story opens with a serpent pursuing our hero, Tamino. It tells you everything about this Magic Flute that here it's a giant gold, red and black "Chinese-inspired" dragon with two heads, each bobbing ominously on its long neck. (When you've designed something that cool, why stop with one head and neck, right?) Soon, the Queen of the Night enlists Tamino to rescue her beautiful daughter, Pamina, who has been kidnapped by Sarastro, an evil magician, she tells him. Along the way, Tamino and his new friend, the gentle bird catcher Papageno, come upon seven very big birds with plump polka-dot bodies, each more colorful than the next; this against a backdrop of animated crayon-type sketches. That describes just two eye-popping scenes in this three-hour multimedia production. All this -- starting with the animated-crayon-sketched lines, like the Toccata and Fugue in D Minor section of Disney's Fantasia on drugs, slowly filling a screen as the Overture plays -- would be more than sufficient to delight the many kids in the audience. But if you're going to introduce children to opera, not to mention please the opera-loving grownups in the house, you must offer a feast for ears and eyes. Happily, the singers in this Magic Flute have no trouble attaining the same level of artistry as the costumes, sets and those wonderful animals. When the original Queen of the Night, Albina Shagimuratova, became ill, Kathryn Bowden stepped in to sing that role's two famous arias. It says everything about the depth of talent available to SFO that a man who had specifically come to the opera house to hear Shagimuratova sing was heard shouting "Brava! Brava!" after Bowden performed. In his San Francisco debut, the young American tenor Paul Appleby makes a sweet-voiced Tamino; even better are soprano Sarah Shafer, a feisty, vocally powerful Pamina and baritone Efraín Solís as the simple, kind-hearted Papageno. Bass-baritone Alfred Reiter, a commanding Sarastro, hit low notes that only whales and humans with good hearing could discern. Maria Valdes made the most of her small role as Papageno's exuberant intended, Papagena; while tenor Greg Fedderly was such a lively Monostatos, the villain of the piece, it was a joy to watch him looming over Pamina. With Solís, these three could give Broadway veterans some competition. Indeed, this version of The Magic Flute calls for more acting chops than usual, because it is filled with jokes and gags performed, with sometimes manic energy, in English (from a translation by SFO General Director David Gockley). Emanuel Schikaneder's libretto, with its mix of whimsy and moral seriousness -- Sarastro turns out to be the wise and compassionate leader of the Temple of Light, whose initiation rites Tamino and Pamina undergo before uniting in perfect love -- has always been problematic to many. I don't think it's unimaginative or stubbornly conventional to prefer the original German; to me, the linguistic distance enhances the storybook aspect of the libretto. Making everything more explicit only makes it less comprehensible. But it's pointless not to be adventurous in planning a new production of a two-century-old opera. If using English engages the next generations as much as the masks and animals, then it should be applauded, if not wildly. Oct. 29, Nov. 4, 8, 12, 14, 17 and 20, War Memorial Opera House, 301 Van Ness Ave., S.F., 415.864.3330, sfopera.com. 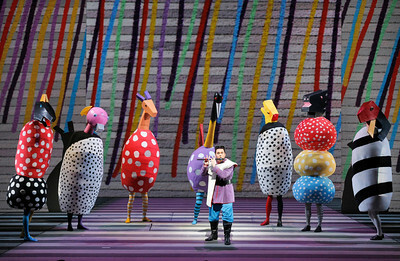 Photo: Paul Appleby, as Tamino, and magical big birds in San Francisco Opera's Magic Flute.